♣ Collecting a Soil Sample (Video-Online). Shows procedure for collecting soil samples for nutrient analysis from a garden or small farm. C.G. Cogger. 2010. ♣ A Guide to Collecting Soil Samples for Farms and Gardens (PDF/HTML-Online). Fery, M. and E. Murphy. 2013. EC 628. Oregon St. Univ. Ext. Serv. ♣ Determining Soil Texture by Hand (Video-Online). Learn how to estimate the texture of your soil by working a soil sample with your hand. C.G. Cogger 2010. ♣ Estimating Soil Texture by Hand, Estimando la Texture del Suelo (PDF-Online). Flowcharts, English and Español versions. C.G. Cogger. ♣ Water and Soil: the Sponge Analogy for Soil Moisture (Video-Online). Explains the role of soil pores in water movement and water holding capacity using a sponge as an analogy. C.G. Cogger 2010. ♣ Soils of the Puget Sound Area (PDF-Online, use browser’s vertical scroll bar to page through slides). A set of 29 slides that show the major soil types of the Puget Sound area, how they are related to local geology, and their suitability and limitations for different types of land use. C.G. Cogger. ♣ The Soil Biology Primer (HTML-Online or order hardcopy). A useful guide to the types and roles of soil organisms and soil ecosystems. Many color photos. From the Soil Quality Institute, US Dept. Agriculture-Natural Resources Conservation Service. Photo of tractor mounted Giddings probe for deep core sampling of soil. WSU does not provide testing, but the following databases list a big selection of laboratories for testing of soils, water, air, composts, plants, fertilizers, etc, for nutrients, diseases, chemicals, contaminants, etc. These links are not WSU verified sources of information. Listing dos not imply endorsement. ♣ Analytical Laboratories and Consultants Serving Agriculture in the Pacific Northwest (Website Database). ♣ Analytical Laboratories Serving Oregon (PDF/HTML Online). Andrews, S., D.L. Walenta. C.S. Sullivan, L.V. Henderson, and L.J. Brewer. 2017. EM8677 Oregon St. Univ. Ext. Serv. ♣ List of Laboratories on The North American Proficiency Testing Program Website (Website Database). ♣ Washington State Department of Ecology Database of Accredited Laboratories (Website Database). ♣ Understanding Soil Tests. (PDF Slideshow-Online, 28 slides, use browser’s vertical scroll bar to page through slides). Cogger, C.G. ♣ Soil Test Interpretation Guide (PDF-Online). Horneck, D.A., D.M. Sullivan, J.S. Owen, and J.M. Hart. 2011. EC 1478. Oregon St. Univ. Ext. Serv. 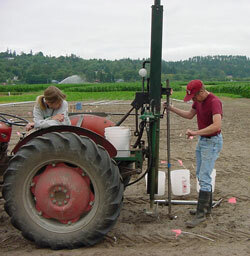 ♣ Soil Nitrate Testing for Willamette Valley Vegetable Production (PDF-Online). Sullivan, D.M., N.D. Andrews, A. Heinrich, E. Peachey, L.J. Brewer. 2019. EM 9221. Oregon St. Univ. Ext. Serv. ♣ La Composición y Análisis de Suelos (PDF Presentación de diapositivas, 23 diapositivas, utilizar la barra de desplazamiento vertical del navegador a la página a través de diapositivas). Cogger, C.G. ♣ Silage Corn (Western Oregon) Nutrient Management Guide (PDF-Online). Hart, J., D. Sullivan, M. Gamroth, T. Towning, and A. Peters. 2009. EM8978-E. Oregon St. Univ. Ext. Serv. ♣ Sweet Corn (Western Oregon) Nutrient Management Guide (PDF-Online). Hart, J., D. Sullivan, J.R. Myers, and R.E. Peachey. 2010. EM9010-E. Oregon St. Univ. Ext. Serv. ♣ Post-Harvest Soil Nitrate Testing for Manured Cropping Systems West of the Cascades (PDF-Online). Sullivan, D.M. and C.G. Cogger. 2003. EM8832-E. Oregon St. Univ. Ext. Serv. ♣ The USDA website has a wealth of information on soil types, classification, maps, soil quality, state soils, soil uses, etc. A new addition is on-line access to county soil surveys. This is a work in progress; some counties have the complete survey available on line, while others are only partially done. ♣ Soil Use and Management. ♣ State Soil Surveys or ♣ Soil Survey Online Interactive. ♣ Field Indicators and National and State Lists of Hydric Soils in the United States.